What’s your child’s definition of ‘five minutes’? For mine, it varies according to the fun factor. If they are playing at the park and want “Just five more minutes!” I know they really mean thirty. On the other hand, when my three-year-old tells me “I’m bored of shopping in five minutes”, I know we are moments away from a supermarket meltdown. In fairness, adults also stretch the meaning of ‘five minutes’ but now there is a watch that will keep everyone on time, including children who can’t yet read a clock. 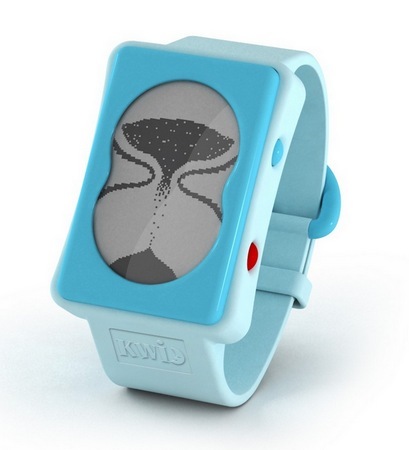 The unique hourglass function of the Kwid Learning Watch helps children understand the passing of time in a simple, visual way. Parents choose the duration of the hourglass and set it at the beginning of an activity that needs an end point, such as watching tv or playing before bedtime. When the hourglass runs out an alarm and animated character indicate that time is up. The watch also features a digital number display and clock hands for when children are ready to learn how to tell the time. The Kwid is £22.95 and is available from the Baby Sleep Shop, who ship internationally.